The key to success with this idea is to make sure you cut your veggies into sticks. 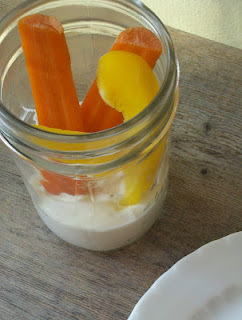 Carrots, celery, peppers, even jicama all work here – experiment and have fun. I used 1/2 pt. regular mouth Ball canning jars here, you can use the wide mouth if you desire. Mix the ingredients above together and allow to sit for at least four hours. Place 2 tbsp. of dip into bottom of jar, followed by veggies – serve.